One of the most iconic Porsches of all times was the 356 Speedster which was a stripped down basic Porsche setup for racing and was very popular in the post war United States. 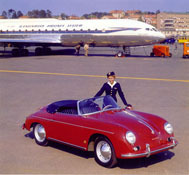 There were many variants to the 356 line and several different body styles. Early 356’s were easily identified by their split or flat windshields. The successor for the early Speedster was the 356A (Curved windshield) and in 1958 the Speedster replacement was the Convertible D. with declining interest in small roadsters at a time when American cars were larger than life, the small roadster production numbers dropped, making these low production 356A D convertible highly coveted by collectors. While the D convertible was produced only for the ’59 model it it was actually built from Aug 1958 to August 1959 and roughly 944 Convertible D’s made, 2 of which had Carrera engines. 4-cylinder 1582cc 70HP engine was the designated engine used in the Convertible D and weighed 1,675 lbs. Currently a 356A Convertible D ranges in value from $78,000 to $185,000 which in the last year is roughly a 10% increase over 2011 values.